Customers navigate the Billiard Factory website and tools on their secure kiosk. The Billiard Factory kiosk allows visitors to view online inventory and options. The Billiard Factory, a national retailer of pool tables, game tables, bar stools, home theater seating, shuffleboard tables, and more, offers customers a self-service kiosk option for those customers who need a bit of time to peruse the inventory, plan their game room, and/or wait for an available sales team member. The project, led by Director of Information Technology Ken Santoro, is currently deployed as a pilot kiosk, located in the Billiard Factory flagship store in Houston, TX. The Billiard Factory was looking to improve the customer experience, provide visitors with entertainment and information, allow store patrons to interact with online tools, and provide sales team members with a method for showing game room layouts, inventory options, out-of-stock products, and more. The Billiard Factory kiosk is designed to allow shoppers to browse the store’s inventory at their own pace. In addition, customers can access the Billiard Factory’s Virtual Game Room Designer, allowing them to design their own game room layouts. This enables visiters to visualize pool tables, accessories, chairs, and other furniture in their own home. When the kiosk is not in use, an attract screen appears. The primary idea behind this screen is to showcase design ideas as well as provide demonstration videos from some Billiard Factory products and current promotions. This allows for adding a virtual sales person to the store. By providing product demos and game room designs, the kiosk helps customers get ideas and visualize how they might want their game rooms to look and feel. It is a great starting point to showcase the possibilities with prospective buyers. unattended setting, the kiosk provides a safe environment for visitors to learn about the Billiard Factory offerings and ignite their imaginations. Secured with KioWare Lite for Windows, the Billiard Factory kiosk uses basic browser lockdown to secure and protect the device and user data. Using KioWare’s quick exit options, Billiard Factory staff can easily exit KioWare, allowing them to log in as a sales user and gain access to a full browser and desktop environment. Here, they can access the Billiard Factory point of sale system and competitor websites to further improve the customer experience. 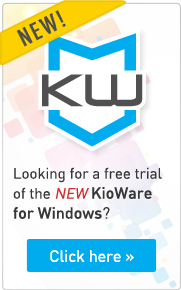 KioWare Lite for Windows can be configured to utilize attract screens. These screens appear when the kiosk is not in use. The Billiard Factory uses KioWare’s attract screen option to shuffle through current specials, unique product designs, and merchandise demonstration videos. In today’s lean environment, customers tend to outnumber the support staff during unexpected times of activity. The kiosk is a great tool to allow the store patrons to browse inventory and plan their game rooms while waiting for a sales rep to become available. Other websites that the kiosk allows them to access are the Billiard Factory’s Houzz page, a Billiard Factory website dedicated to home theaters, educational material showing pool table construction, and a pool table buyer’s guide. KioWare is installed on a HP ProDesk 400 with 8 GB RAM and a Core I7 Intel Processor. Due to its miniature footprint, the computer is unobtrusively placed in a small enclosure built into the coffee bar. The pilot kiosk is located in the Billiard Factory pavilion at the flagship showroom in Houston, TX. To provide customers with a relaxing atmosphere while they browse, the pavilion is outfitted with a pub table and free water and coffee. The kiosk is available to customers to use alone or with the assistance of sales staff. It is currently on a 47” LCD monitor, but the team is looking at exchanging that for a 55” screen as they move out of the pilot and into a full deployment. By offering visitors an interactive option for perusing inventory and designing game spaces, the Billiard Factory leverages technology to improve the customer experience. While only one kiosk is currently deployed in this pilot project, the technology and configuration can be distributed across all of the Billiard Factory brick and mortar locations should this become a full-scale rollout in future.